Monster Spiders! Giant Slugs! Pigs with nausea issues! Ruin World by Derek Laufman is an all-ages adventure comic that packs all of this and more into a fast-paced and exciting issue that will have fans engaged from the first page. 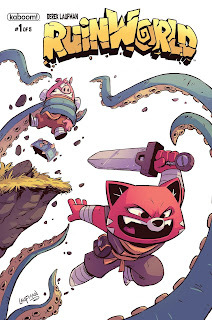 The story follows adventurers Pogo and Rex as they explore the ruined world just beyond the border in search of magical relics. 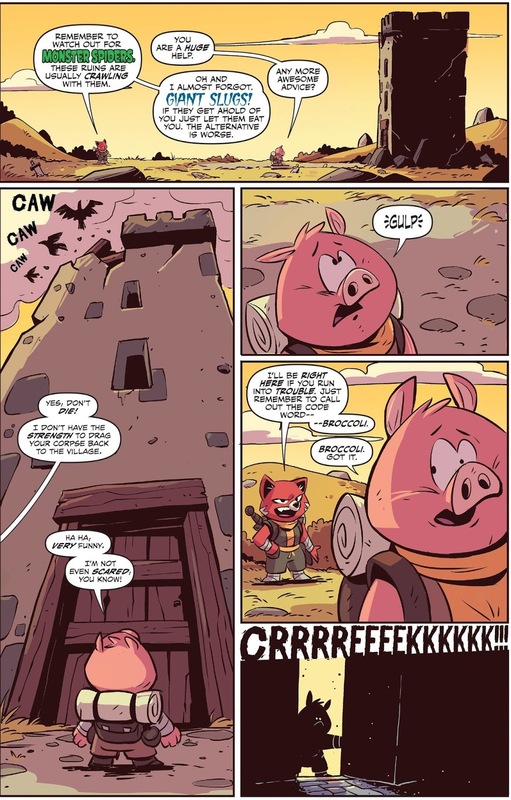 Their first adventure takes them to the ruins of Rygone's Keep, a small tower with a big secret. Sword swinging adventurer Rex decides he's explored the last few ruins on his own and has earned a rest, so he sends Pogo into the keep in search of magical artifacts. 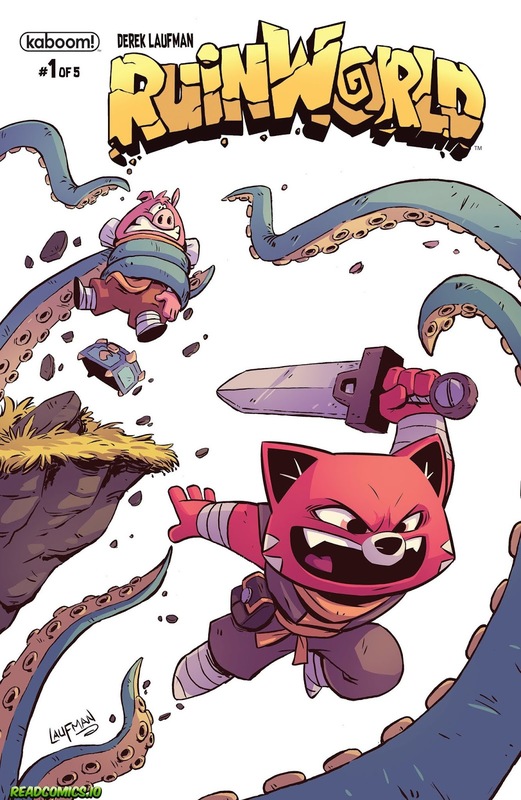 Despite his many protests and concerns about monsters Pogo forges ahead and proves himself to be a success if chaotic, relic hunter. The plot moves quickly from the start, sketching the simple premise of the story and then diving right into the adventure and fun. Rygone's keep is full of surprises, of both the magical and monster variety. 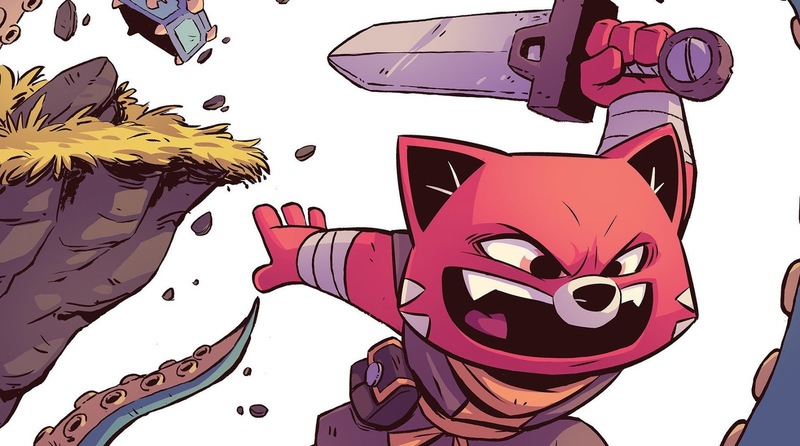 Pogo's dogged determination to succeed is endearing and his dialogue with himself and Rex is entertaining as he explores (especially his Army of Darkness moment with a spellbook). Rex's over the top heroics are a comedic counterpoint to Pogo's misadventures and the combination had me laughing many times as I read the issue. As the story progresses we also meet Barri, a scavenger with a secret of his own. His backstory is explored in the issue and helps make him a well-rounded character with his own motivations rather than just a one-dimensional foil for Pogo and Rex. The entirety of Ruin World feels real and fleshed out, without getting bogged down in any heavy backstory narration. Even small characters like the mother and son looking for a cure for the “snoots” feel alive and entertaining, even if we only see them for a panel or two. Derek Laufman's art is incredible and fun. 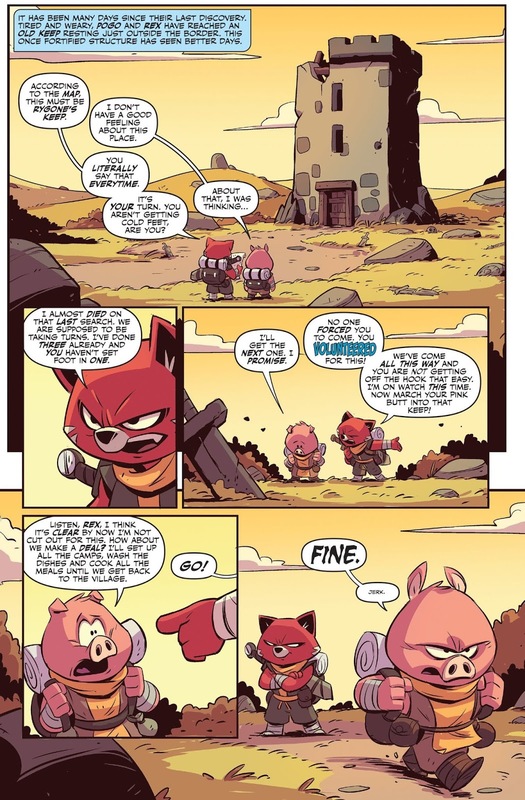 All of the characters are vivid and the art conveys each character's personality perfectly, from the mischievous “snoot” tossing rabbit boy to the nefarious gangster Fargus. His excellent use of perspective also adds to the reader's immersion, especially in Barri's portions of the story. The action scenes are especially fun thanks to the simple, but the effective art style and excellent framing of the action panels. The color palette also adds to the reader's immersion into Ruin world. Scenes in the wild ruins feel sparse and empty without seeming boring or drab. City scenes feel busy and lively without being distracting or too busy. This issue is a great introduction to Ruin World which will grab readers of all ages immediately and keep them engrossed in the story throughout. The world is rich, the art is amazing and the entire issue feels like a treasure that we as readers have been lucky enough to find. Bits and Pieces: The lettering by Warren Montgomery adds some great emphasis throughout the issue and adds a fun dimension to a lot of the dialogue. This book truly feels like an “all ages” title, not just something aimed at kids. Artist and Writer Derek Laufman is passionate about the story and it shows in every panel.